Adding to the versatile and powerful VRX portable line array series, JBL Professional introduced the VRX915M two-way floor monitor at prolight+sound show 2006 in Frankfurt. The VRX915M is a 15-inch stage monitor designed for live performance, corporate audio/video staging and sound rental companies. With a 375mm (14.75 inch) stage height and the use of the latest neodymium JBL transducers, the VRX915M is compact and lightweight. Its compact size and low profile provides minimal obstruction of audience sightlines, while a 2265H Differential Drive woofer handles 800 watts (continuous) and delivers accurate and precise low end. The 2452H, 4-inch voice coil compression driver, coupled to a 50°x 90° aluminum horn, provides smooth and clear highs, critical for high performance monitoring. Through the VRX915M, bi-amp or full-range passive operation can be selected via a recessed, high-current switch mounted alongside the NL4 input connector in one of the handle cups. An additional NL4 connector is mounted in the other handle cup for a convenient loop-thru connection minimizing cable runs on stage. 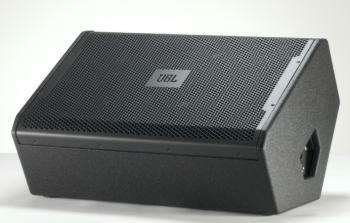 The enclosure of the VRX915M is constructed of Baltic birch plywood and coated in JBL's rugged DuraFlex finish. It is a symmetrical 30° wedge design, with four non-slip rubber feet per side enabling convenient left and right applications of adjacent monitors. The transducers are protected by a 16-gauge CNC-machine’s steel grille. It is internally lined with acoustically transparent foam to provide additional transducer protection.